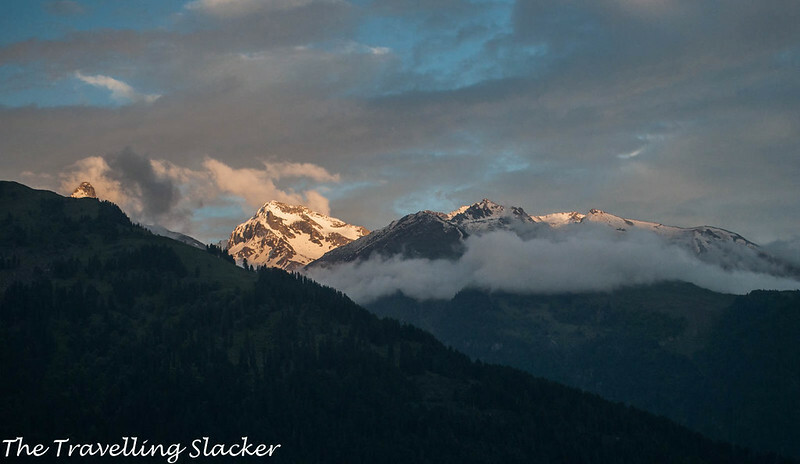 Last summer I reached Manali with several apprehensions and all of them turned out to be true. The room rates were three times the normal rates, all roads were clogged with traffic and the Mall Road reminded me of Lajpat Nagar Central Market (just like Kasol reminds me of Hauz Khas Village nowadays). There is a reason why I avoid the old school hill stations of India but sometimes I am forced to spend a night due to unavoidable circumstances. Nevertheless, the purpose of this post is not to trash the place but to explore the ways to salvage the situation. I have been to Manali two more times after that, again due to compulsion rather than by choice but now I feel that I am better equipped to survive the same. 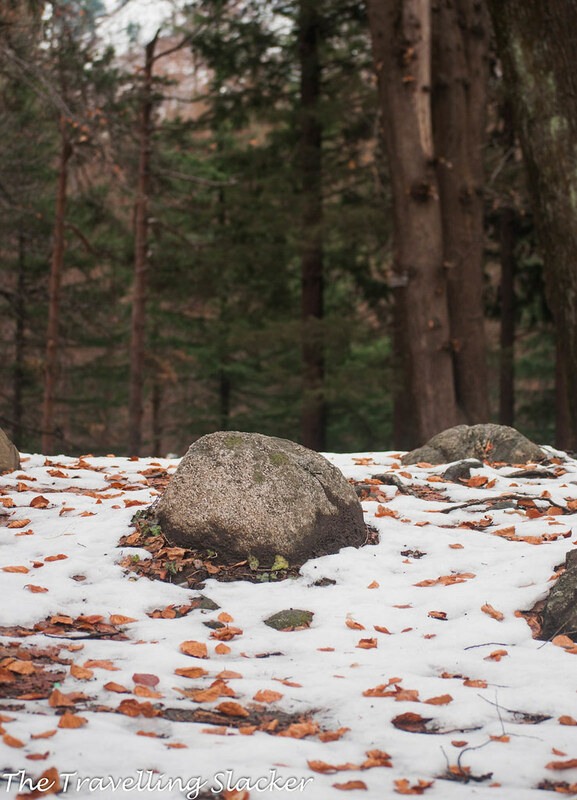 Last January I came to Manali in the thick of winter. I had an assignment and all my costs were being taken care of. So, I could just lazily walk around without bothering about my nonexistent bank balance. Manali was still crowded. I expected it to be lower considering the weather but actually it almost had the similar level of crowd, all looking to experience snowfall. The hot spring in Vashist was also in the middle of a stampede, not that I wanted to get into that anyway. However, despite all this, I felt that there is a certain beauty in the snow clad Manali that remains unbesmirched. 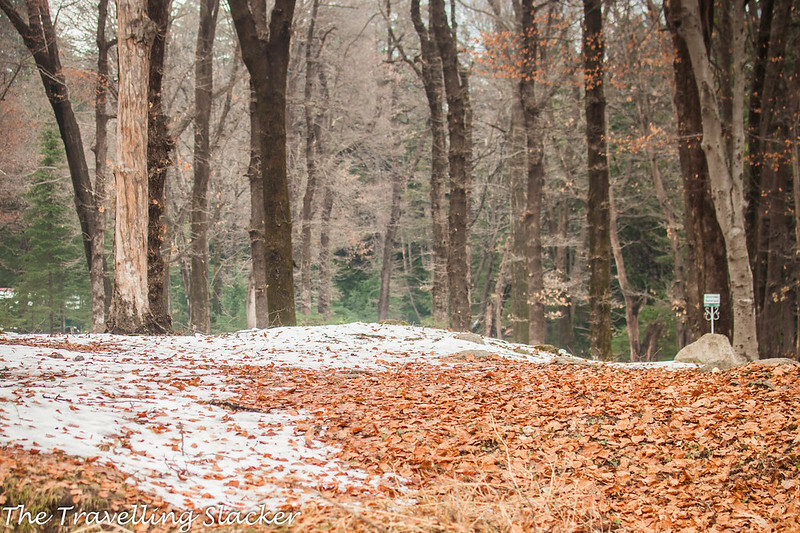 What I particularly liked were the sight of denuded apple trees barely withstanding the snowstorm and the orange cover of fallen conifer leaves over the pristine white snow. Cut to this month, I returned again. Again, I had no plan to do so but I had to wait for a few days before the next adventure. 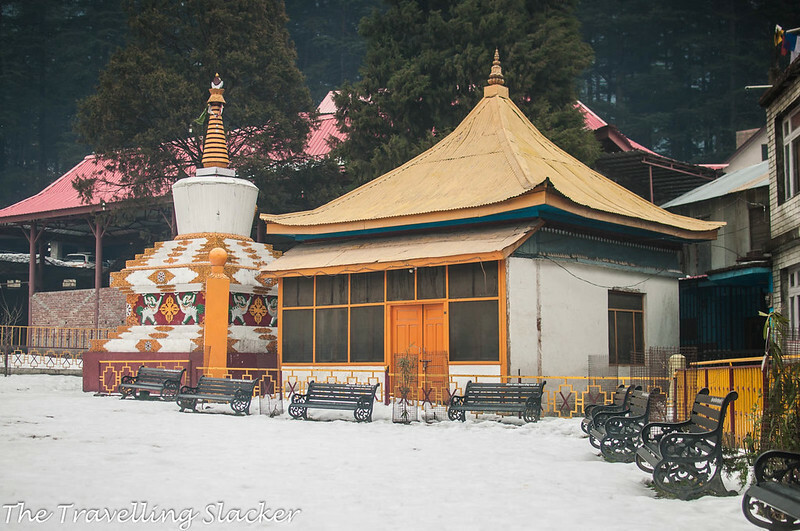 I was determined to not get fleeced by the Mall Road hotels and also to find out if there is actually a way to salvage the experience by finding some unusual things to do in Manali. 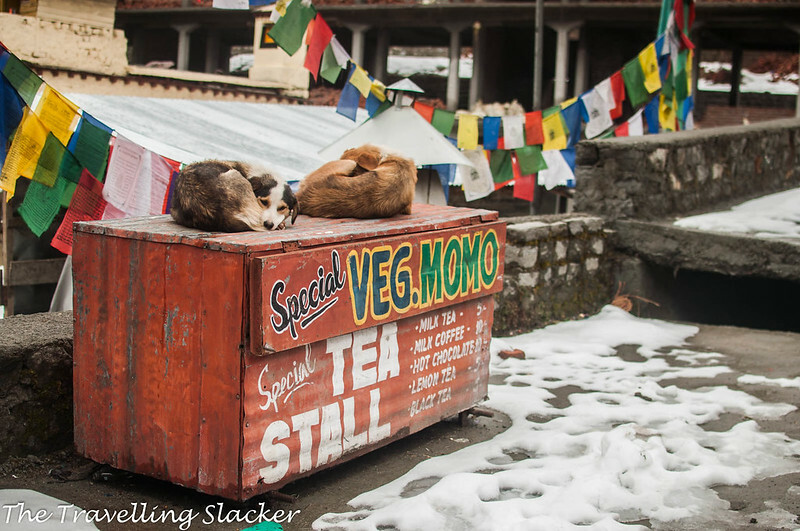 I decided to explore the hostel culture in Manali, something I was always aware of but not sure if it was also as overrated as the rest of the place. I booked Nomad’s Den, which seemed to be the cheapest option of all with its six-bed dormitory. Eventually it turned out to be a good place, located a bit far from the crowd by yet not too hard to find or reach. 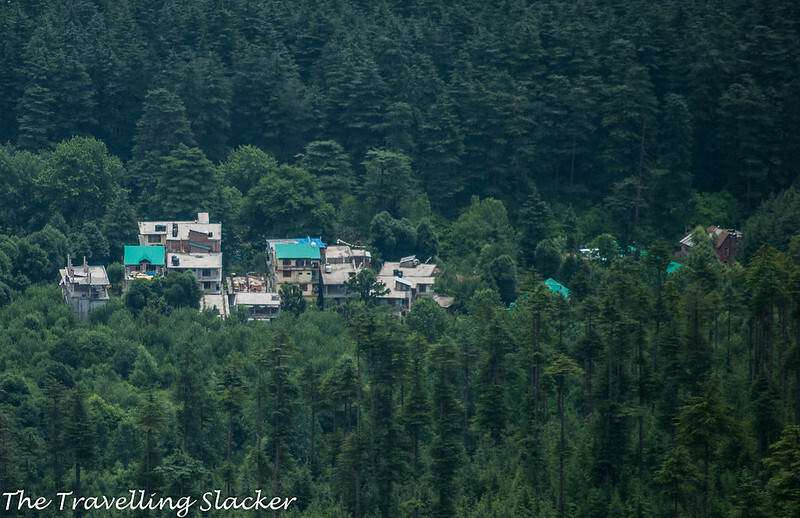 At a slight elevation, it overlooks the Manali town and the surrounding forests. I met a Chilean couple who are planning to start their travel blog, some Spanish girls volunteering at the kitchen, and a few young British lads serious about their cricket, serious enough even to watch an entire India-Sri Lanka match. Facilities were just about right for a coworking space, without going overboard and keeping the prices low. The weather looked threatening at times but then again it cleared to reward us with great views of the peaks and occasionally the moon. The best was the evening when a double rainbow showed up. To be honest, i don’t think I had ever seen one before. Also, it looked so close from the terrace that it almost looked like a real thing rather than an optical illusion. 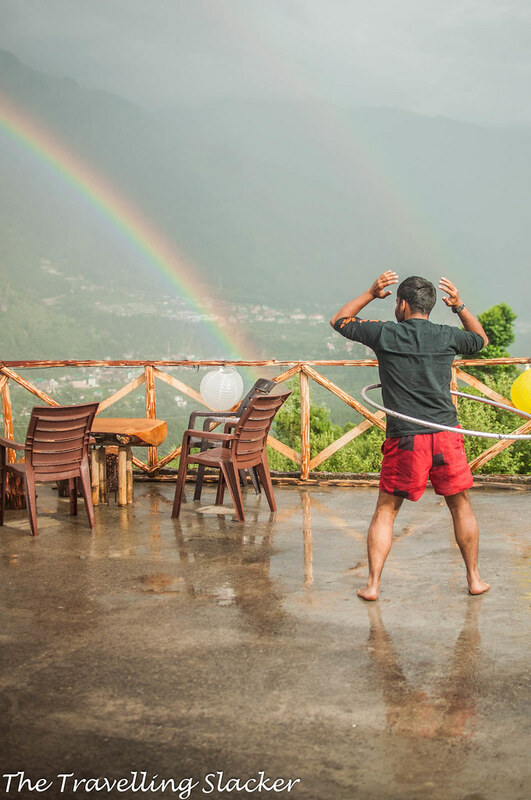 It made everyone delirious, I rushed for the camera and the hostel owner burst into a seductive hula hoop session, reminding the Leboswky fan of Husucker Proxy. So, after multiple deliberate as well as forced experiences, I feel that there are still ways to have a decent time in Manali. 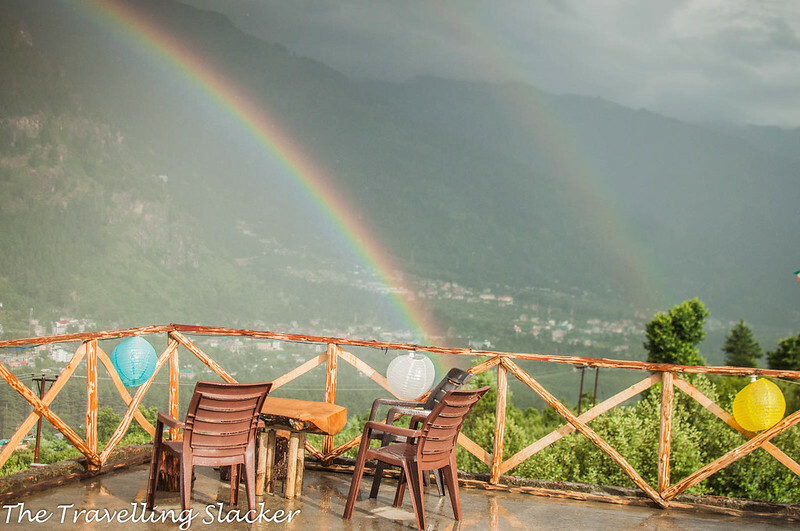 So, here are a few offbeat experiences in Manali that can help genuine, cash-starved backpackers. Do note that this is by no means comprehensive and these are just my personal preferences. (And no, Vashist is NOT offbeat, save yourself from such misleading cliches). Even the better know treks from Manali seem to have become very popular. Besides, not every body wants to do the long, multi-day treks such as Hampta Pass or Bhrigu Lake. But there are many small treks that one can consider. I tried the Lambadug Trek as the trail started near my hostel. I did not complete it because I started half-heatedly and started very late. But the views of Manali from an elevation was great and there was no other trekker barring a couple of girls from my hostel dorm. Apparently the views are better if you do manage to reach the alpine meadow at the top. 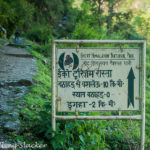 Another option I noticed is the one that starts from the Manu Temple in Old Manali and goes to Goshal Village and then further to Solang Valley. 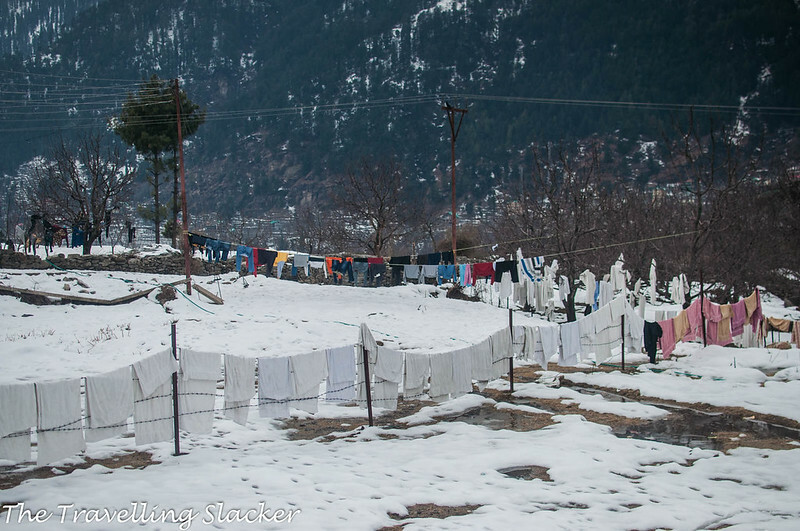 I have never met anyone who trekked from Manali to Solang. Maybe you can try. This region is a part of the ancient Kingdom of Kullu. Although the new touristy avatar has buried most of those treasures, you can always find a few if you look for. 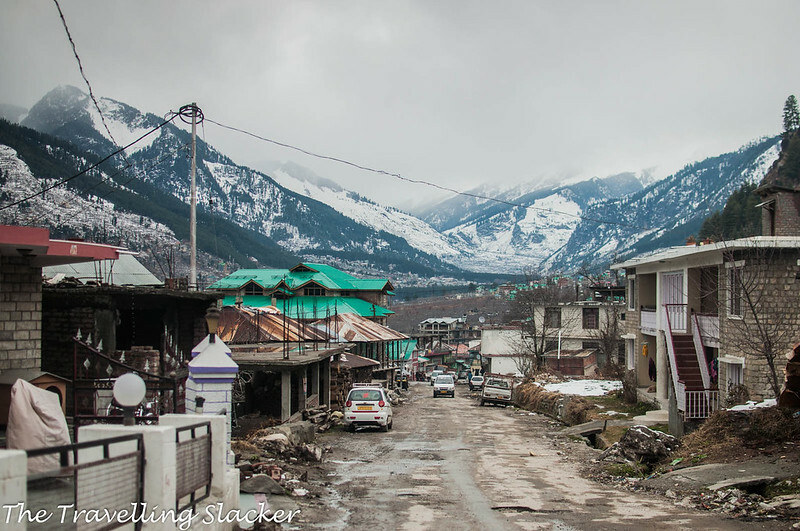 Last winter I made it to Jagatsukh, now a small settlement between Naggar and Manali. But it used to be the capital of the kingdom at one point and now there are a few temples remaining. The women from the family of priests showed me around. They also seem to have started a homestay near the temple now. There are some other temples. I have already said enough about Naggar, The Roerichs, and Devika Rani. The nearby village of Rumsu is the base for Chanderkhani Pass Trek to Malana and one can also hike to the Jana Falls. 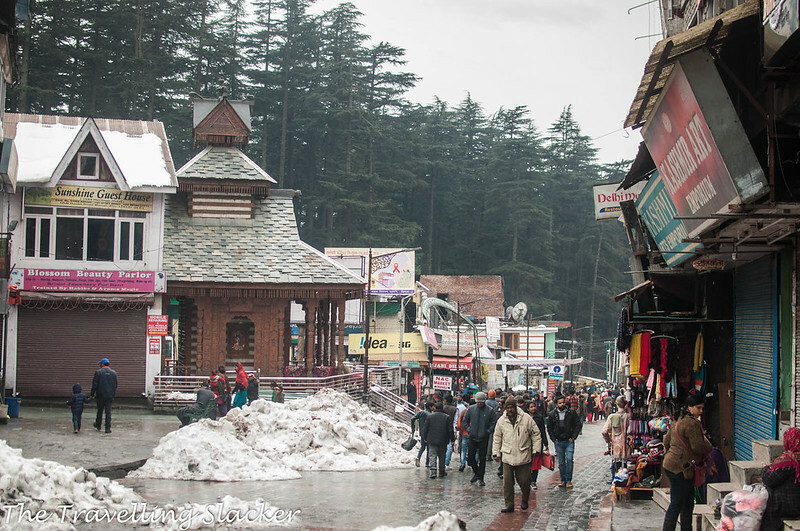 More importantly, if you want a peaceful place near Manali to spend a few days, Naggar has many options. There are some expensive cottages but there are also many affordable homestays offering authentic experiences with homemade food. Right now I am typing this from Chander Lok Guest House that has a sitting space in the garden covered with kiwi vines. It also has an ancient temple that was apparently dug out during construction. I am still paying in mid three digits. You can also try to explore the villages and sub-valleys near Manali. Also, the Old Manali still remains popular, in case you know how to do it. 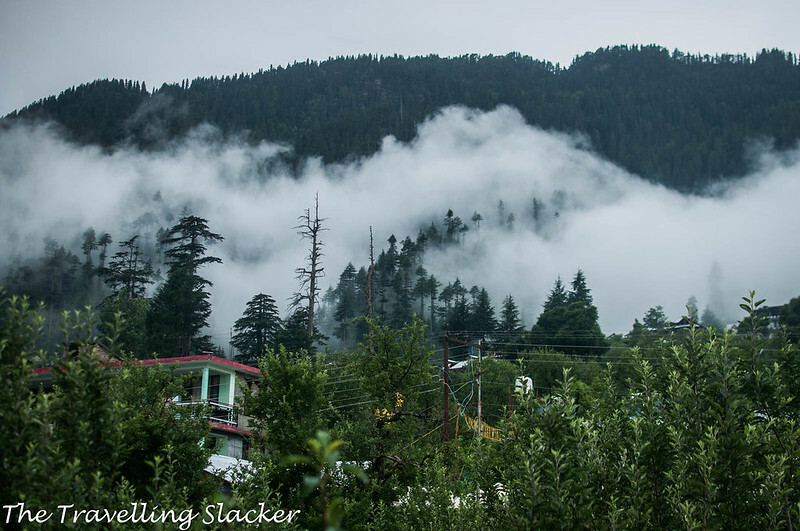 Here is another post on offbeat destinations near Manali that can help you discover newer gems like Sethan and Hallan Valley around 15 KM-SOuth East at Manali. To get to these areas you will have to hire a vehicle, or reach Prini on the Manali-Naggar Road and then find local transport. 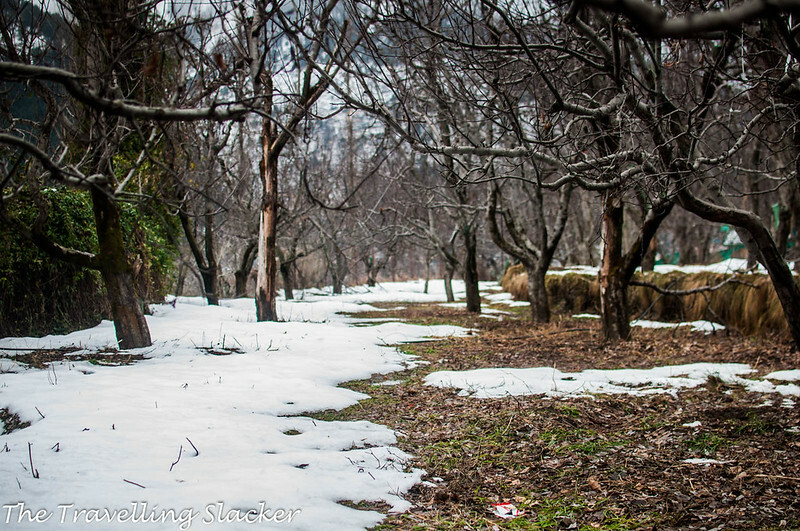 Camping at Sethan amidst apple orchards should be a great way to experience the delights of Kullu region. Lug Valley is a densely forested area in Kullu where the people are known to be among the friendliest you will ever meet. Apparently the name came from timber trade that flourished here during the time of the British. The omnipresent pulley systems used in Kullu and many other areas of Himachal to transport goods and people accross the rivers was first developed here for this trade. There are many trek routes here that goes deeper and higher into the mountains. A Multi-Day trek will take you on the other side to Barot Valley in Kangra district. I intend to target the crossing next season. 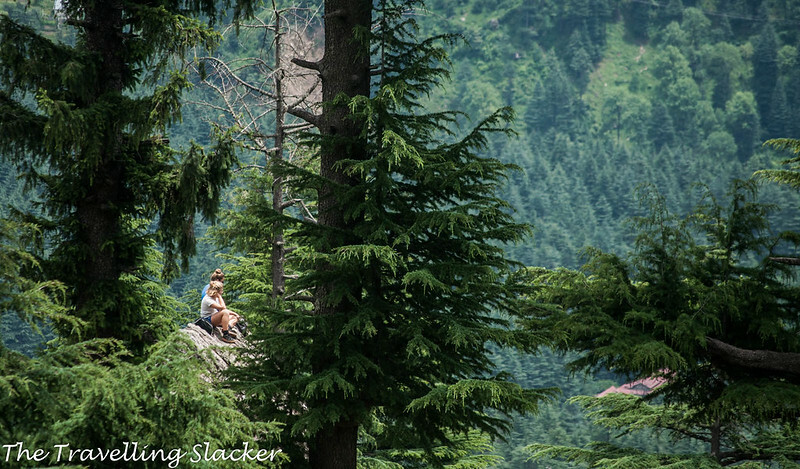 Kaisdhar is a day hike between Bhunter and Kullu through dense cedar forests. I am yet to do this part so can’t say much about it. There is a forest resthouse (FRH) here which itself is a big attraction. If you want to experience true desolation and relief from touristy kitsch of Manali, camping here can be a good idea. You can also find some ancient temples here, built in traditional wooden architecture of the region. 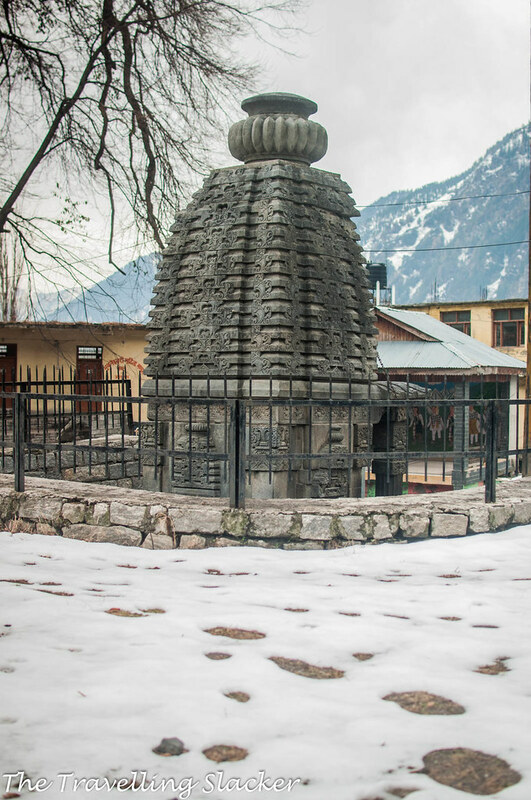 Bijli Mahadev is one of the primary deities in Kullu. The temple atop the hill can be reached after a short hike and it offers excellent panoramic views of Beas and Parvati Valley. “Bijli” literally means lightening. It is believed that the tall staff erected at the temple compound attracts the divine blessings through lightning and the priests of the temple restore the Shivling inside the temple as it gets shattered during every lightning. You will get buses to the nearest village from Kullu Bus Stand for this trek. The one I stayed is located near the Hadimba Temple. 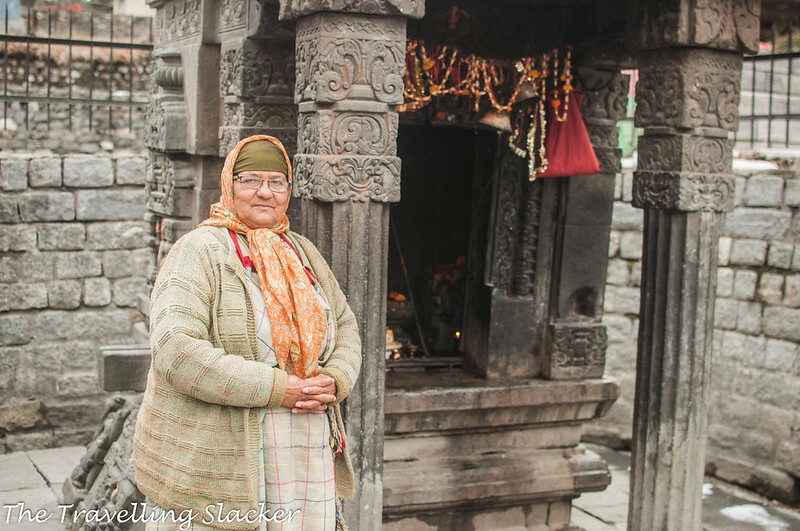 There are many others, mostly in Old Manali. Don’t just go for the big hostel chains that are coming up nowadays. There are many individual ones offering better deals. Just do some research before booking. 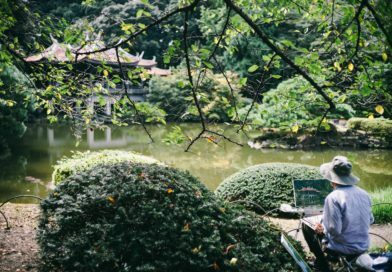 These are also the best places to mingle with people from other nationalities, do some work, or just read a book sitting amidst apple orchards. 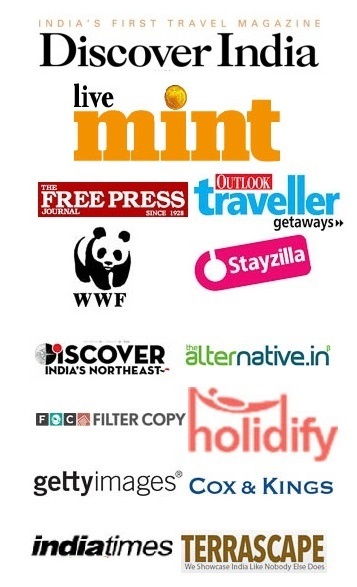 They should normally have free Wi-Fi so they are perfect for digital nomads looking for offbeat places to stay in Manali. I think I have sufficiently explained my hatred for the Manali Mall Road already. But if there is one place there to return every time, that is the bookstore called Bookworm. It is not on the main road but inside one of the inner alleys. 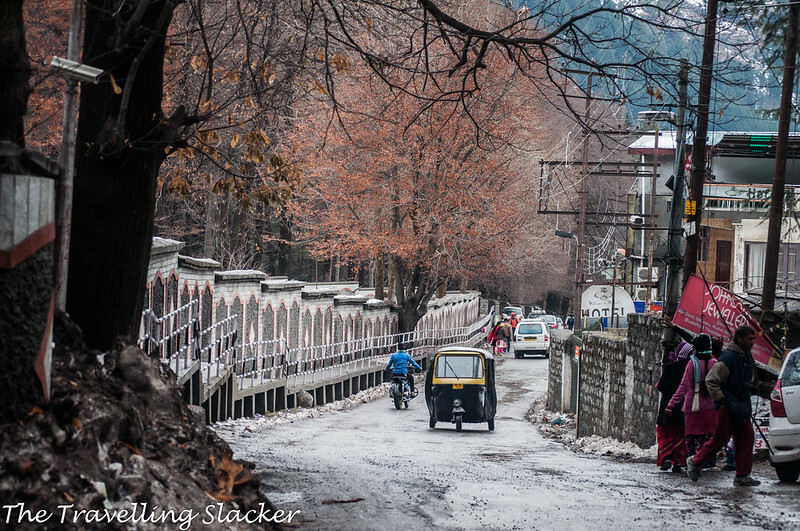 I once just stumbled on it but I return every time I come to Manali (But it may be closed down during winters). I like it because it stores some of the best travel literature and some very rare guide books and other gems regarding various Himalayan regions, people, religion, and culture. You will never find some of these books in the stores of your respective cities. 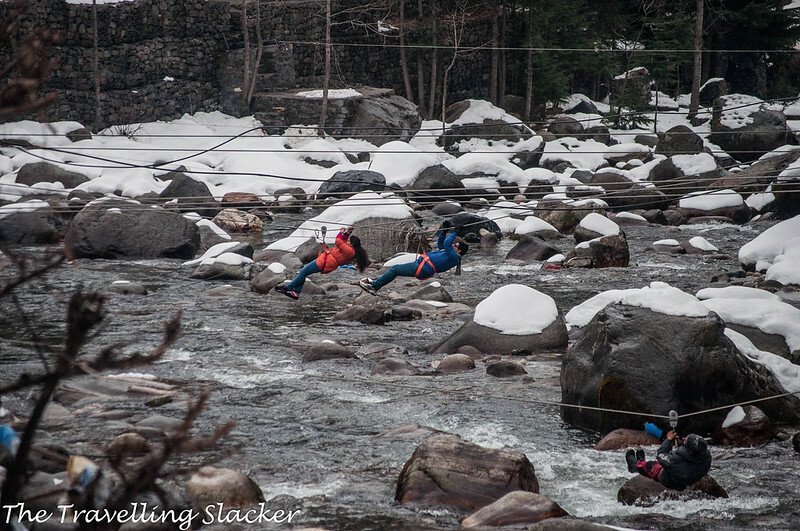 Again, the main attractions in the Kasol-Parvati Valley region is no longer offbeat. I have practically seen every major point in that valley and no longer a fan of it. It is still possible to find good places though. You can just go through my Parvati Valley Guide. Similarly the Great Himalayan National Park should work as a good detour as both Tirthan and Sainj valleys have enough treks and trails to offer. The day treks sound great and that hostel looks awesome. I love to stay in hostels because it’s such a great way to make new friends that you wouldn’t meet in a hotel or airbnb. Thanks for the comprehensive review and feedback – very helpful! Can’t believe those rainbow shots you got either. This place looks amazing. I hadn’t heard about it before. The scenery looks so impressive. I’d love to hike there nd embrace the beautiful nature. And get to know their past and traditions wold be the best especially if locals are showing you around. As a keen nature lover and hiker, this is really a place I would like to visit. I understand some of the negative aspects that you have mentioned but I can’t get over some of the photos you have posted here showing how beautiful the natural area is. Truly a place I would love to experience. That photo of the chilly dogs broke my heart. Despite the downsides your photos make this look like a place that I want to get out and go explore. A few nice day hikes is always a lot of fun when you have a central base to go from. I’m glad you mentioned day treks in Manali as that’s what I did and it was excellent, I got wonderful pictures too! I never explore the hostel culture and the hostels which were not part of a chain, I’ll look into the one you recommended. I’m interested to visit the Bookwork bookstore there too. What a diverse part of the world (sorry, i had never heard of Manali before and had to look up what country it was in). I would love to visit that little bookstore in the alleyway, or try out a few of the day treks. I’m sure the scenery would be worth any of the hilly exhaustion. That double rainbow moment must have been so surreal! Manali looks nice. I understand why the accommodations have high rates. However, it was good that you were able to find hostels. It is a great place to meet other travelers. 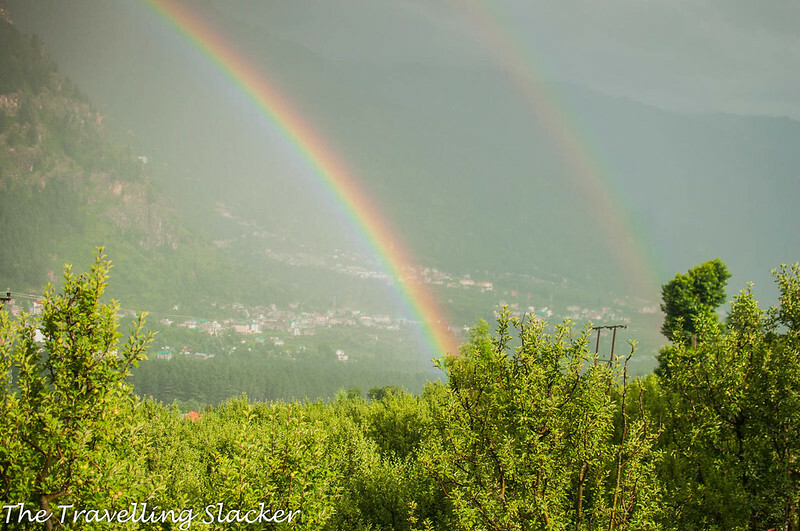 The photos of the double rainbow look amazing. It is quite interesting that you found a bookstore here. You must have bought rare books. Summers can be too much crowd, I would definitely plan something in winters. And mid 3 digit rentals sounds unbelieving good. I will take all these addresses when I visit. Already craving for some home made food in these places. I absolutely love your tenacity in not quitting on it and making the best of the situation. Sounds like going further into the valley is the right move to check things out. The hostel culture is not for everyone, but it is so good to meet people and learn more about the place you are in. Hi. It seems like I have met you at Nomad’s Den. If you were there on 5 June,2017. This is a dream destination for me! Excellent and very motivational post, Jitaditya! Amazing. Loved the post and pics.